Click the photos to view each of the Christmas and winter-themed sun catchers up-close. Description: Brighten your winter with these colorful red mittens attached together with twisted wire. Measuring 4 inches x 4 inches they can hang in a window or on a tree branch. They are also available in green or blue. Other colors can be requested by special order. 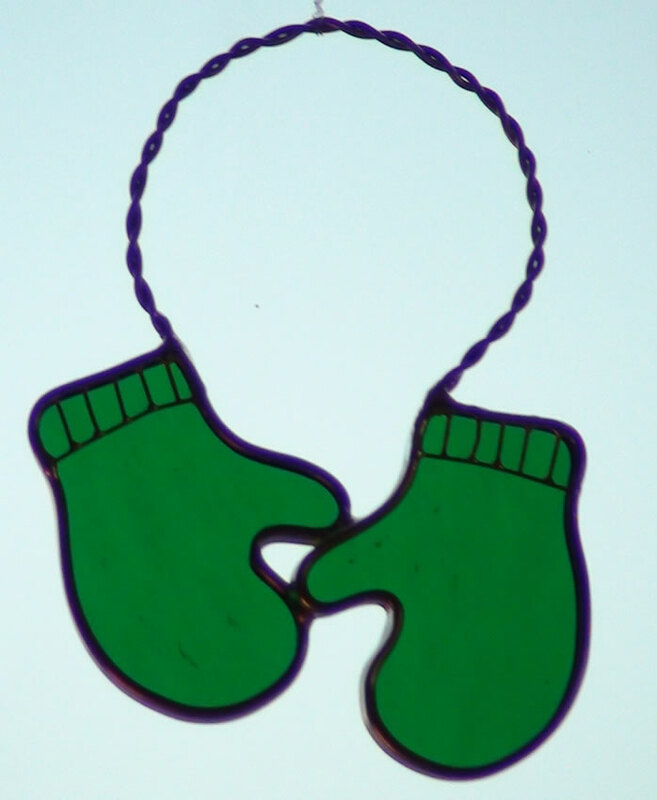 Description: Brighten your winter with these colorful green mittens attached together with twisted wire. Measuring 4 inches x 4 inches they can hang in a window or on a tree branch. They are also available in red or blue. Other colors can be requested by special order. Description: Brighten your winter with these colorful blue mittens attached together with twisted wire. Measuring 4 inches x 4 inches they can hang in a window or on a tree branch. They are also available in red or green. Other colors can be requested by special order.